Rose Cottage, Tanah Rata, Cameron Highlands. This is our favourite escapade. 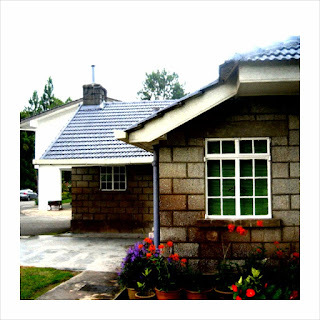 Although we have not done it for many years, I do yearn to have an escapade back to Rose Cottage in Cameron Highlands. What do we do there? We lugged our PCs and set up a LAN and play PC games ALL DAY AND ALL NIGHT LONG.. and we ate Maggie Mee, junk food, drink Coca Cola, Nescafe, make our own Western Breakfast (luncheon meat, sausages, hard boiled eggs, red beans). Don't you think it's fun? Was just wondering if you have any photos of how Rose Cottage looks like inside (the interior) and are the toilets n rooms clean? Anonymous - I don't have interior pictures, unfortunately but I can assure you of its comfort, quality and cleanliness. It's definitely a class of its own.. but the price is higher, of course. The view over the golf course is breathtaking! who did u book the place with ? I last stayed at Rose Cottage way way back in 1982 and it had a nice garden with lots of rose bushes but looking at the photo now, its all gone. Can i have the contact for ROSE COTTAGE? I wanna book that bungalow for my holiday. Hi people, if you care to read the comment - Rose Cottage is not for rent anymore. The owner decided to take back the bungalow and live. Sad news to all of us! As such, I will not be able to provide contact.